From the Darkness promises us "the secret origin of The Dark Archer". 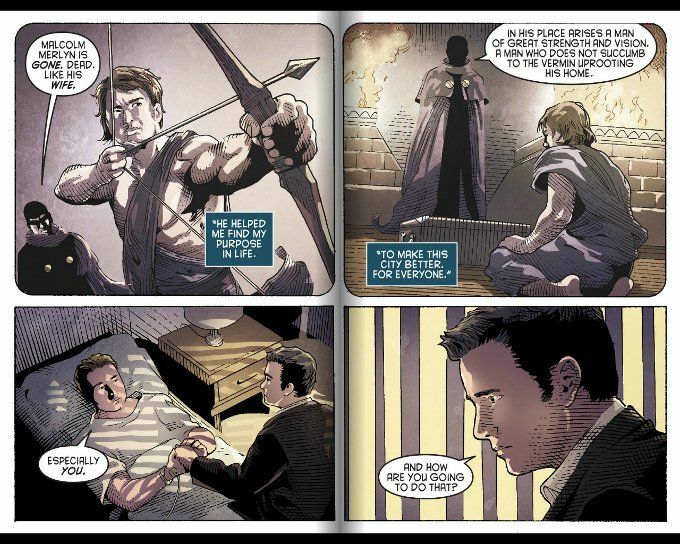 While we do get the details of how Malcolm Merlyn became trained as a world-class warrior after his wife's death, there's not much that is "secret" about it. The only new piece of information is the revelation that Malcolm patrolled the streets as a vigilante hero during Tommy's formative years, in the same way Oliver Queen does today. The script by Wendy Mericle and Ben Sokolwski proves engaging but it leaves us with more questions than answers. One wonders why, if Malcolm Merlyn was striking down drug-dealers and pimps in The Glades on a regular basis several years ago, we've heard nothing about this on the show before. 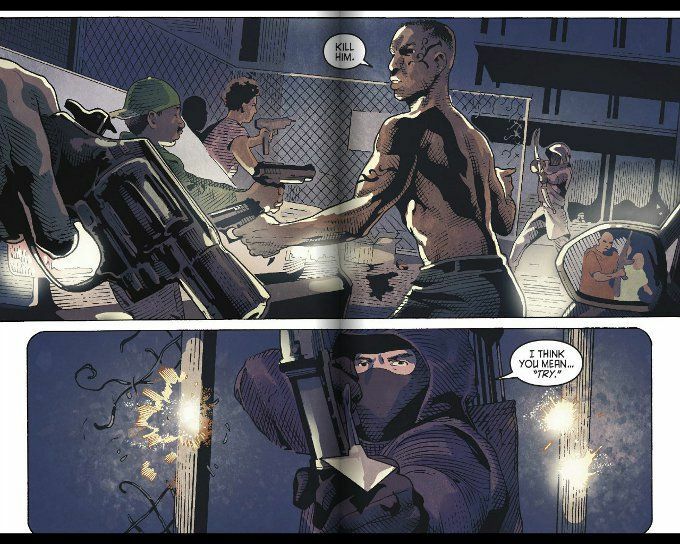 You'd think Detective Lance would remember there being a similar vigilante sometime earlier unless gang-members turning up dead with arrows in their back is a common occurrence in Starling City. Or did every single murder The Dark Archer committed in the name of cleaning up the city go unreported? Granting that the criminal underclass of The Glades aren't exactly likely to call the cops, you'd think someone would have reported a dead body with an arrow in it at some point. The artwork by Allan Jefferson is unbalanced. Jefferson does a fair enough job of capturing John Barrowman and Colin Donnell's likenesses but - as in previous outings on this series - his mid-range and background characters lack definition. Jonas Trindade's inking does help matters somewhat but there's only so much a good inker can do.